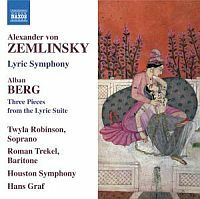 Alexander von Zemlinsky's best known work, tbe seductive Lyric Symphony, inspired A1ban Berg, who quoted its third movement in his own Lyric Suite, tbree movements of wbich Berg himself arranged for string orchestra. Described by Theodor Adorno as "a latent opera", Berg's masterpiece was publicly dedicated to Zemlinsky but carried a secret programme: his illicit love for Hanna Fuchs-Robettin. Zemlinsky's richly scored symphony, a late-Romantic song cycle by any other name, recalls both Mahler's Song of the Earth (8.550933) and Schoenberg's Gurre-Lieder (8.557518-19).